Wafcol Complete Original Dog Food has been specifically formulated to support the nutritional requirements of an active adult dog. The specially selected blend of oils, vitamins and minerals help ensure that your dog stays in peak physical condition, strong bones, well developed and toned muscles, healthy teeth and gums and a thick, glossy coat. The delicious recipe contains 20% protein and is completely maize free which is particularly useful for dogs that suffer skin problems and overheating due to an allergic reaction to maize. 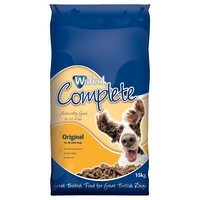 This nutritionally balanced diet is suitable for all adult dogs and is easy to digest. Whole wheat flour, poultry meat meal, wheat bran, soya, rapeseed oil, yeast, vitamins and minerals. Protein 20%, Crude Ash 5%, Crude Fibres 4%, Oil 6%.